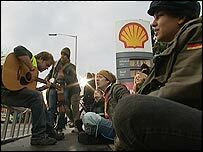 Environmental protesters have blockaded a Shell petrol station in Birmingham city centre. About 20 activists have been stopping cars from entering the garage in Bath Row near Five Ways. They are showing support for residents of Rossport in the Republic of Ireland who are objecting to a gas pipeline being built near their homes. It was agreed with police and the garage that the peaceful protest would end after three hours. Three of the protesters had chained themselves together to stop cars getting into the garage while others waved banners and sung songs.